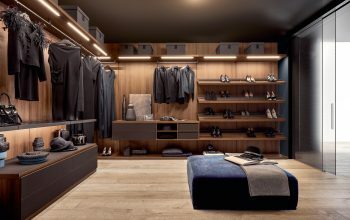 Create the walk in wardrobe of your dreams with our luxury range of products. We know the value of practical storage for the modern home. So whether you need to convert a spare room, create a small walk in area, have sloped ceilings or other awkward spaces, we can create a solution that works for your needs. We can also create a dressing room or dressing area combining all your wardrobe storage with a place to get ready. 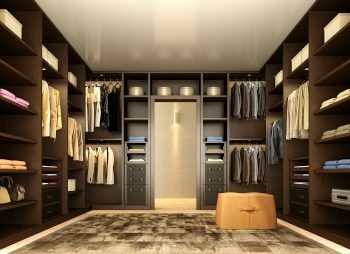 Our experts are on hand to advise and design your walk in wardrobe. 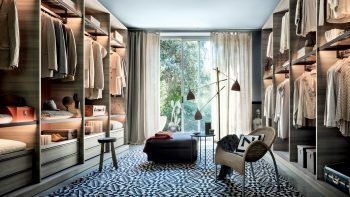 Our aim is to make it simple and easy for you to get your dream walk in wardrobe, working with you one and one to create something spectacular. Take a look through some of our past work, including a range of different walk in wardrobes from our collection. We work extensively across the UK to give our customers fantastic choice, service and care. We’ve put together some of the most popular layouts and ideas for a walk in wardrobe. 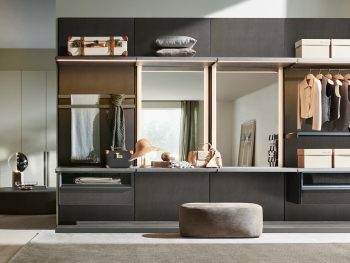 Whether you need to utilize a small space or spare room, or create a dedicated walk in area of the bedroom, we’ve listed out some inspirational ideas of how to configure your space. + All our wardrobes are Made in Italy by Designer brands. + Superior long lasting products. + High quality manufacturing and materials. + Both Open Wardrobes and Panel Systems available for any space. + A range of finishes, styles & storage accessories available across our brands. + Providing visual design concepts to give you an idea of what your product will look like. + Our experienced fitting team will seamlessly and efficiently install your walk in wardrobe. 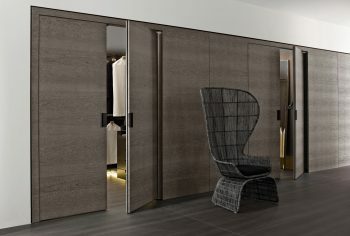 + Pair your walk in wardrobe with our internal glass doors to create a designated space. 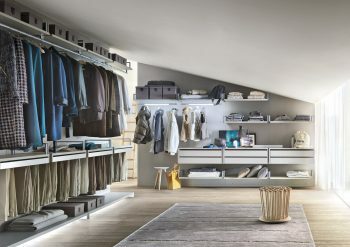 All of our contemporary walk in wardrobes are 100% Italian made. We deal with a selection of leading manufacturers, offering authentic, superior quality designs and products. Produced to the highest standard, you’ll find structures and shelves made at 2.5 – 4cm thick, giving you complete product stability. As standard all of our sliding door wardrobes come with mechanisms on top, without the need for a bottom track on the floor. These are just some of the ways in which our products stand out. Every product we sell is completely contemporary. 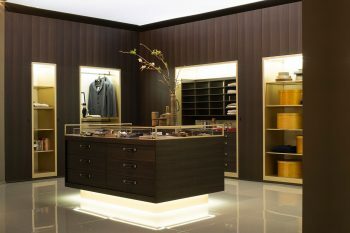 We take pride in offering some of the best modern designer walk in wardrobes out there. Across our range you’ll find different types of systems, islands and alternative hanging solutions. We have 2 main types of walk in wardrobes, that can offer the best solution to fit your space. Our ‘Carcass’ based systems are complete with sides, allowing you to separate your clothing pieces, essentially a wardrobe without doors. Alternatively, we offer ‘Panel’ systems, these are absent of sides, with all equipment mounted on to wall back panels. This is a great way to increase storage space by having a free flowing feel. Our walk in wardrobes are available in a range of different materials and finishes. Across our brands you’ll find a vast range of woods, lacquers, glasses and more to choose from. Each of our products has a diverse selection, you can even mix finishes together to create a contrasting look. There is even the possibility to add extra luxury to you walk in. Some of our internal equipment can be made with eco-leather details, such as drawer fronts or shelf tops. We know how important maximizing your storage space is, which is why we can supply different accessories to suit your needs. Choose from items like drawers, shoe racks and trouser racks or shelving & cubbies to name a few. 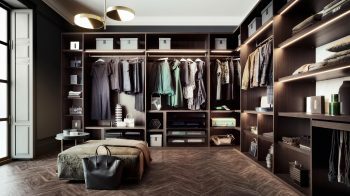 As specialists in storage, we can also offer advise on ways to optimize the storage potential of your walk in, using different accessories.